What are the post–Cold War trends in armed conflict? What are the global strategic trends that characterize and influence the environments in which conflict takes place? Are there any trends that might portend a change toward increased interstate conflict? Armed conflict has declined in both frequency and intensity since the end of the Cold War. The trends are especially clear for interstate conflict, but they also hold true for intrastate conflict. Taking into account historical trends and projections of key conflict drivers, the interstate and intrastate baseline future conflict projections in this report depict a continued decline through 2040, with interstate conflict down to extremely low levels and a much lower incidence of intrastate conflict. Some divergence from these projections is likely. The three factors that most strongly increased interstate conflict expectations were declining U.S. preeminence, declining capabilities of international organizations, and declining prevalence of consolidated democracies. The incidence of intrastate conflict is expected to increase if the capacity of state institutions or the rate of economic growth declines. 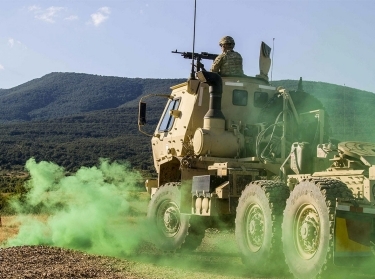 Although the authors' projections indicate that interstate conflict may be rare in the future, the United States must retain a ready and credible land power deterrent to ensure such a future. Such a deterrent might not be used frequently, but its very existence delays the rise of a challenger and has a dampening effect on the incidence of conflict. The authors' projections also indicate that intrastate conflict (including proxy wars) will continue to be the main form of conflict incidence and, given the U.S. position in the international state system, Army forces are likely to become engaged in such conflicts. The trends toward a decrease in conflict incidence do not necessarily mean fewer U.S. interventions. Overall levels of conflict have been declining in the past two decades. Interstate violence has decreased the most, both in the incidence and intensity of armed conflict. Intrastate conflict and low-intensity violence have declined more slowly, but have decreased in incidence and intensity. Both the interstate and intrastate baseline future conflict projections depict a continued decline through 2040. The three factors that most strongly increased interstate conflict expectations were declining U.S. preeminence, declining capabilities of international organizations, and declining prevalence of consolidated democracies. The two factors that most strongly increased intrastate conflict expectations were declining capacity of state institutions and declining rates of economic growth. This research was sponsored by the Office of the Deputy Chief of Staff, G-2 (Intelligence), Headquarters, Department of the Army, and conducted by the Strategy, Doctrine, and Resources Program within the RAND Arroyo Center. 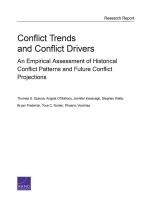 Szayna, Thomas S., Angela O'Mahony, Jennifer Kavanagh, Stephen Watts, Bryan Frederick, Tova C. Norlen, and Phoenix Voorhies, Conflict Trends and Conflict Drivers: An Empirical Assessment of Historical Conflict Patterns and Future Conflict Projections. Santa Monica, CA: RAND Corporation, 2017. https://www.rand.org/pubs/research_reports/RR1063.html. Also available in print form.